Raghupati Singhania, Chairman & Managing Director, JK Tyre & Industries Ltd, has been conferred with ‘Mexican Order of the Aztec Eagle’, the highest honour accorded to non-nationals by the Government of Mexico. 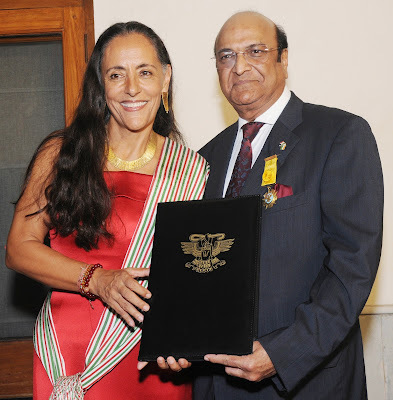 On the eve of the 128th National Day of Mexico, HE, Ms. Melba Pría, Ambassador of Mexico to India presented the award to Dr. Singhania on behalf of the President of Mexico. The top honor is in recognition of Dr. Singhania’s exemplary leadership, his noteworthy services towards humanity and his efforts to strengthen bilateral ties between India and Mexico. In 2008, JK Tyre & Industries Ltd expanded its robust manufacturing operations by acquiring Tornel having three production facilities in Azcapotzalco, Tultitlan and Hidalgo. Under Dr. Singhania’s strategic leadership, the company turned around the facility in the very first year by improving efficiencies and increasing market share across product segments. Over the years, production capacity has been expanded, and Tornel’s global footprint enhanced in North America and the Latin America markets. The company more recently implemented the first-ever labour restructuring programme in Mexico, at JK Tornel by rightsizing workforce. This was made possible due to tremendous help received from the Government of Mexico, particularly the Labour Ministry.